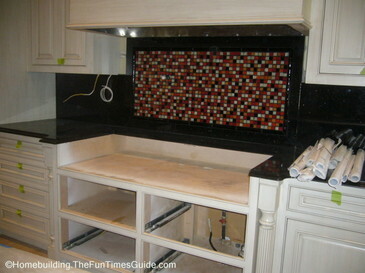 Have a viewing of this custom made glass tile mosaic kitchen backsplash. One thing is for sure… it is entirely unique. 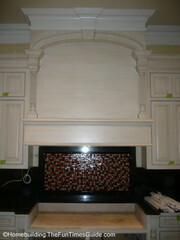 It is the centerpiece above the soon-to-be-installed (humongous) gas range cooktop. There are a total of 940 1-inch square glass tile pieces. As you can plainly see, the colors are red, black, white and clear amber. Two of those colors happen to be the school colors of the new homeowner’s alma mater, the University of Georgia School of Law. Not sure if that’s by design or if it was simply chosen to coordinate with the adjoining grand family room…or both. Either way…it looks great and really injects a nice punch of vibrant color to liven things up. The Victorian home that this beautiful mosaic is located in was currently under construction at the time of this post. The home is in the final stages of completion and it’s just about time for the painters, carpenters and tile man to move on to the next job to make way for the new homeowners. I’ve been waiting and wondering what sort of choices would be made in the kitchen. Kitchens are one of the rooms where people really like to put their stamp on a home to make it their own. This is fun stuff! You may have noticed that there is a little pipe sticking out of the tiles about 2/3 of the way up on the left side. Looks like a kettle faucet is set to be installed very soon. 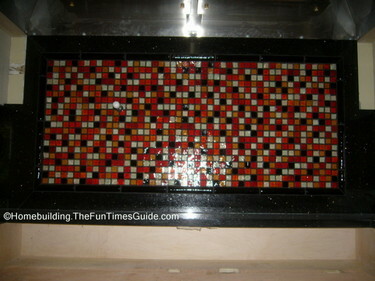 Also of note are the 7″ long, half-round black tiles that frame the mosaic. It’s the perfect compliment to blend with the surrounding black granite backsplash and countertop. Now what about tackling this kind of project on your own? You’ll find some How-To advice and a few eco-friendly manufacturers of recycled glass tiles…if you keep reading. Glass is not porous like ceramic tile. It resists stains, mold and mildew. The colors and combinations at your disposal are endless. Glass tends to reflect light, therefore, your kitchen will likely look bigger and brighter depending on your color choices. 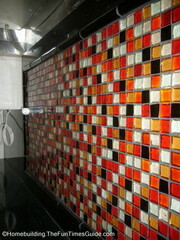 Glass tiles are the greener choice. Why? Because they take about half the energy that it takes to produce ceramic tile. Glass tiles (new) cost more than ceramic tiles (new). Be careful not to scratch your glass tiles! Glass tiles can be difficult to cut. The underlying grout work needs to be spotless. Watch the Paul Ryan video in the link I provide below to see how to deal with smoothing the thinset. You don’t want any trowel marks to show through the glass. No need to worry about this issue with ceramic tile. Oceanside Glasstile: Utilizing up to 86% recycled material…all from curbside collection…and over 2 million pounds of it annually. Sandhill Industries: 100% Recycled glass tiles: Rcent recipient of the Evergreen award for environmental excellence and leadership. Ultraglas: Minimum recycled content used is 15-30%. They specialize in the manufacturing of embossed, molded architectural glass. They’ve released a very informative environmental statement. Modwalls: They sell cork tile, too. It’s made from the end cuts from a wine cork manufacturer. That’s double green…I think??!! Recycling a renewable resource…that’s a deep shade of green. Stardust Glass: Produces handmade tiles ranging from 87-100% recycled glass. My ol’ buddy, Paul Ryan, from HGTV and the DIY Network shows you how to install your very own glass tile backsplash. More glass tile manufacturers using recycled glass and just a bit more info that might be of interest to you….while you’re at it. Won’t take but a minute of your time. Interested in learning more about this Victorian home?